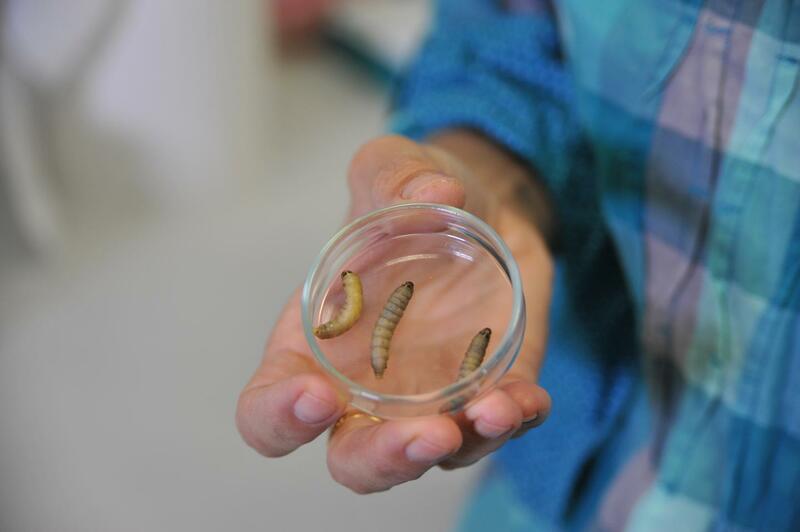 Scientists have found that a caterpillar commercially bred for fishing bait has the ability to biodegrade polyethylene: one of the toughest and most used plastics, frequently found clogging up landfill sites in the form of plastic shopping bags. The wax worm, the larvae of the common insect Galleria mellonella, or greater wax moth, is a scourge of beehives across Europe. In the wild, the worms live as parasites in bee colonies. Wax moths lay their eggs inside hives where the worms hatch and grow on beeswax – hence the name. Bertocchini, from the Institute of Biomedicine and Biotechnology of Cantabria (CSIC), Spain, collaborated with colleagues Paolo Bombelli and Christopher Howe at the University of Cambridge’s Department of Biochemistry to conduct a timed experiment. “If a single enzyme is responsible for this chemical process, its reproduction on a large scale using biotechnological methods should be achievable,” said Cambridge’s Paolo Bombelli, first author of the study published today in the journal Current Biology. Polyethylene is largely used in packaging, and accounts for 40% of total demand for plastic products across Europe – where up to 38% of plastic is discarded in landfills. People around the world use around a trillion plastic bags every single year. “Wax is a polymer, a sort of ‘natural plastic,’ and has a chemical structure not dissimilar to polyethylene,” said CSIC’s Bertocchini, the study’s lead author. The researchers conducted spectroscopic analysis to show the chemical bonds in the plastic were breaking. The analysis showed the worms transformed the polyethylene into ethylene glycol, representing un-bonded ‘monomer’ molecules.